Should I remove runs that have been imported with warnings? Unable to perform mass calibration for function 3. No calibration has been applied to this function. In the future, we expect that enhancements to the support for different data formats will mean that further diagnostic information will be provided in these warnings. Keep an eye on the Nonlinear Dynamics blog and the data formats FAQ to monitor the availability of enhanced data import support. "1328 scans after scan 3600 were ignored because they had lower retention times." If you're not confident that each run in the file covers the same retention time range, then it's probably best to remove the run from the experiment. This is because, otherwise, you could end up with the tail end of a later run appended to the whole of the first run in the file. 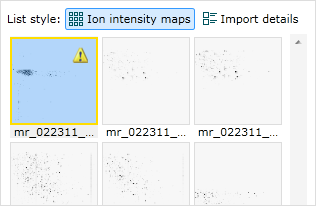 Conversely, if you're confident the ion map shows only a single run, it may be ok to keep the run in the experiment. This situation appears to arise from the use of some third party tools that convert vendor-specific file formats into mzXML. "Some m/z-intensity pairs were skipped because the m/z values were lower than preceding pairs." This is known to occur with some files generated from Orbitrap Elite machines. 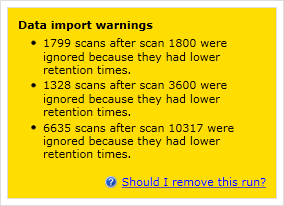 The warning message appears if some m/z values within a scan are slightly lower than preceding values. In this case the points with lower m/z values are skipped. In this situation, you can fix the issue by upgrading MSFileReader to at least v3.0 SP2 (3.0.29). "Unable to perform mass calibration for function 3. No calibration has been applied to this function." This warning occurs for Waters data when calibration data is missing or invalid, so your data will be left uncalibrated. The _HEADER.TXT file is missing from the raw data folder. No calibration parameters were found in the header file for the given function. Too few calibration parameters were found in the header file for the given function. A calibration parameter is too large or incorrectly formatted. No calibration type was present for the given function. If your calibration has not been carried out externally, we recommend removing the run and checking that the raw data folder is in tact and has not been modified since being created (specifically the _HEADER.txt file). If this happens regularly, you should contact your Waters representative. How do I remove a run from my experiment?